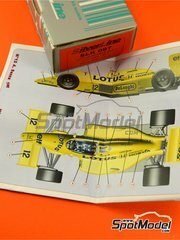 The yellow machine on which Ayrton Senna won the North America GP, now available for you in 1/43 scale to complete your collection. The kit includes rubber printed tires, white metal parts, photoetches, decals and a detailed instructions manual, so you just need to add in the Zero Paints colors for your Lotus. 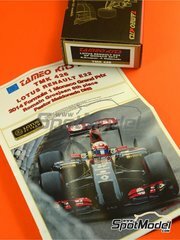 The spectacular car with which Grosjean finished eighth at Monaco Grand Prix 2014 have been chosen by Tameo for modeling in 1/43 scale. In addition to the 3D printed instructions, a great number of white metal parts, rubber printed tires, photoetches, and awesome decals printed by Cartograf. Remember to use Zero Paints Lotus black to get the perfect finish for your kit. 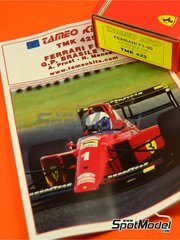 Made with the excelent quality usual at Tameo, here's the Ferrari F1-90 with which Prost got the victory in the Brazilian GP. Inside the gorgeous red box, you'll find tons of white metal parts, a photoetch sheet, and exquisite decals printed by Cartograf. 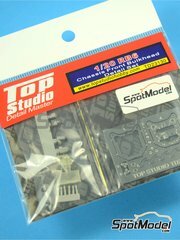 As always, a detailed manual in full colour and with 3D images will help you build this great kit. 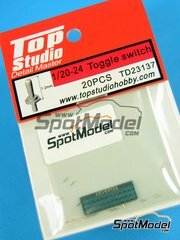 Bring to life the cockpit of your McLaren MP4/5B kit with this detail up set from Top Studio. Inside the gorgeous black box you'll find: several resins for the steering wheel, seat and fire extinguisher, photoetches for the pedals, harness and settings selector, turned metal parts for the gear shift, and fabrics for the seatbelts. It's just AWESOME!. 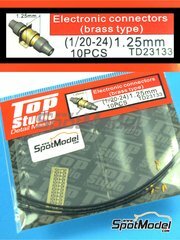 Electrical connectors set in bronze for recreating the connectors used in modern race cars and bikes. Can be used in either 1/20 and 1/24 scales, and also features black heat-shrink tubing for simulating cabling hose. The classic flip switch used from the ancient times in racing. 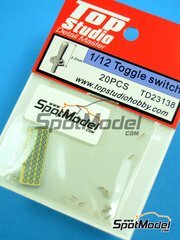 Featuring CNC turned metal parts in 1.2mm length and one photoetch, it's perfect for 1/20 and 1/24 scales. Here's the classic flip switch used from the ancient times in racing. Featuring CNC turned metal parts in 2mm length and one photoetch. Improve the looks of the RB6 kit with this detail up set, featuring resin parts and photoetches for recreating the carbon parts on the actual car, hidraulic fluid reservoirs and different electronic components. 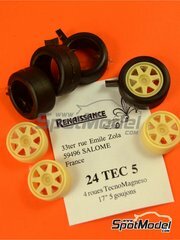 During the 90s, TecnoMagnesio rims were widely used in rally cars such as Ford Sierra or BMW M3. Here's the 5 nut version, also featuring slick tyres for road stages. 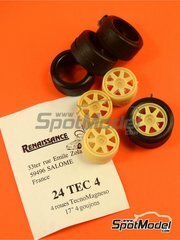 TecnoMagnesio rims where widely used in 90s rally cars like Ford Sierra or BMW M3. Renaissance has recreated the four nut version shown, also including the slick tyres for the road. 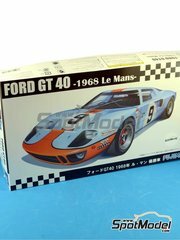 Here's the reedition of this classic Fujimi kit of the winner of Le Mans 24 hours in 1968. A gorgeous machine in Gulf colours, that you can decorate with three different numbers. 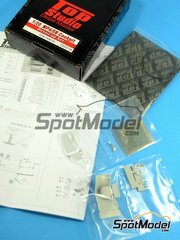 This kit does not allow you an open assembly for the door or bonnet, and it does not include a detailed engine either. 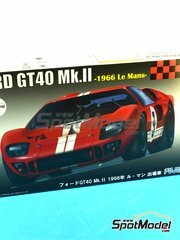 Recently reedited by Fujimi, here's the winner of Le Mans 24 hours in 1966. The kit features a photoetch sheet for the back grid, harness buckles, vertical planes for the bonnet, and bonnet pins. It does not include a detailed engine. 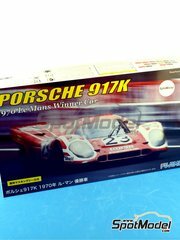 Once again reedited by Fujimi, here's one of the most emblematic kits of the manufacturer for one of the most emblematic race cars ever built: the 1970 Le Mans 24 hours winner Posche 917K. Featuring red and black injected plastic, this kit is absolutely gorgeous, with good fittings and good detailing. Don't forget that doors and bonet do not open. 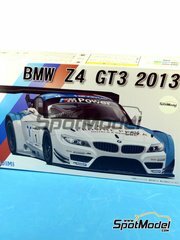 Here's the 2013 year version of the BMW Z4 GT3, slightly modified from the previous versions. Don't miss the wonderful rims and exquisite bodywork. The rest of the kit is... just awesome!! 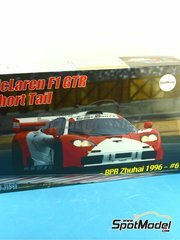 A new version of the hugely popular McLaren F1 GTR Short Tail that raced at the Chinese circuit of Zhuhai with the Marlboro logos. During the assembly, you can decide whether to build it with open or closed doors. WARNING!! Marlboro decals are NOT included in this kit. 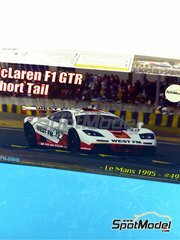 A new version of the McLaren F1 GTR Short Tail that raced at Le Mans 24 hours, that you can now build as you please with opened or closed doors. Fittings are very good, detailing is perfect, and the spectacular 5 spoke rims make this a very interesting kit. 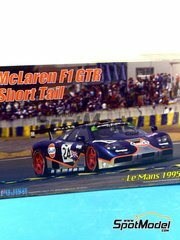 Here's the McLaren F1 GTR Short Tail sponsored by Gulf that raced at Le Mans 24 hours in 1995, a metallic blue beauty that flew over the asphalt. This kit allows allows you both an open or closed door assembly. Fittings are very good, detailing is perfect, and the 5 spoke rims are awesome.